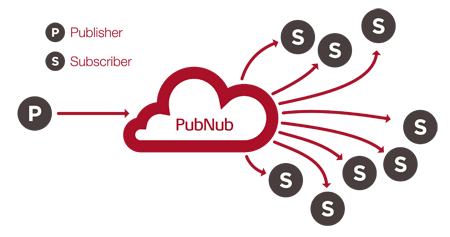 PubNub is a programmable Data Stream Network (DSN) and realtime infrastructure-as-a-service (IaaS) company. Primarily, they are a messaging solution hosted on a cloud service that allows developers to publish data instantly to one or multiple devices. They offer other realtime functions such as Presence, that can show which users are on or offline. This makes their services great for multiplayer in-game messaging, live-blogging, helpbots, and customer support. The core of PubNub is the publish/subscribe realtime mechanism. They allow clients to subscribe and send messages to multiple channels. Pub/sub messaging provides instant event notifications for distributed applications, especially those that are decoupled into smaller, independent building blocks. You can send and receive messages with their publish/subscribe messaging on mobile, web, IoT, desktops, and servers. With their realtime messaging, you can subscribe up to 10,000 streams with a single socket connection, retrieve your message history, and send securely with end-to-end encryption. Presence, powered by PubNub DSN, delivers automatic realtime detection of device and user to identify who and what is connected. With Presence, you can signal devices when users connect and disconnect, stream custom statuses like typing notices, and pass customized information about a connected device’s last known state. Pubnub Functions is a serverless environment that allows you to create and execute functions on the edge of the network. You can build microservices that can route, filter, transform, augment, and aggregate realtime messages. With Pubnub functions, you can also make one-click secure REST endpoint functions, trigger sync/async functions, and enrich messages with HTTP calls to 3rd party APIs and services. Pubnub offers production-grade security and end-to-end encryption for every message. They secure messages with TLS and AES256 encryption. You can also BYOE (bring-your-own encryption). No inbound open ports also help prevent regional attacks. Citing PubNub, “The core of the PubNub Data Stream Network is written in C for performance, handling all data replication across PoPs as well as reliability logic for devices connected to the PubNub DSN. PubNub’s data propagation strategy follows a multi-master, high availability model with very high redundancy; every message published into the PubNub DSN by default is replicated to all PoPs, making the messages available to any subscribing device in the world, regardless of geographical location, with the fastest response time possible. When dictated by the customer, geographically-restricted data replication rules are easily configured to ensure that legislatively restrictive data (for example, PII data) can be retained in a single geography, meeting regional legislative requirements such as the EU-US Privacy Shield. What is the PubNub Realtime Network?